A view of Mark Bradford’s Pickett Charge installation at the Smithsonian’s Hirshhorn Museum and Sculpture Garden. 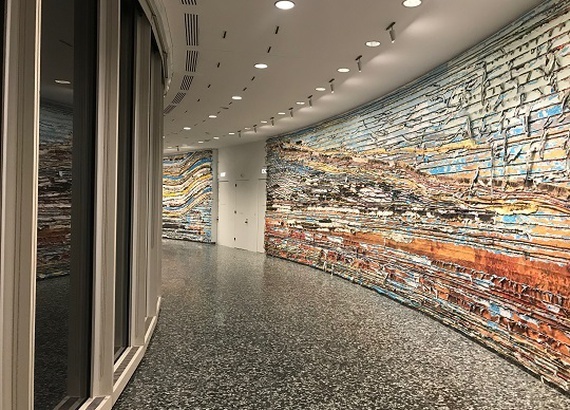 Recently, a group of more than 20 Friends of the Gettysburg Foundation enjoyed a special tour of Pickett’s Charge, Mark Bradford’s monumental installation at the Smithsonian’s Hirshhorn Museum and Sculpture Garden. The new painting spans nearly 400 feet and explores how the narrative of this pivotal event has been shaped over time. Bradford’s exhibit is a custom installation utilizing the circular shape of the Hirshhorn to reimagine French artist Paul Philippoteaux’s nineteenth-century, Battle of Gettysburg Cyclorama in a modern context. Dr. Matthew C. Moen, President of the Gettysburg Foundation, welcomed attendees and spoke about the Foundation’s work in placing Gettysburg at the center of the larger story of conflict and conciliation in American democracy. Moen praised the collaboration between the Hirshhorn and the Gettysburg Foundation that made this event possible, pointing out that Gettysburg has an incredible story to tell that resonates in many different ways with different audiences. Sue Boardman, author of books and articles about the 19th century Cyclorama and Director of the Gettysburg Foundation’s Executive Leadership Program, shared the historical context of the Battle of Gettysburg Cyclorama. Pointing out that “Cycloramas were history’s original Imax theaters,” expected to draw crowds, Boardman explored how viewers were encouraged to lose themselves in the events depicted in these monumental works. Hirshhorn Senior Curator Evelyn Hankins shared the difficulties of transporting and installing the Bradford piece before leading the group on a tour of the exhibit. Focusing upon Bradford’s unique response to our current political and cultural climate, Hankins also pointed out how Bradford used the museum’s distinctive architecture to tell his story. Pickett’s Charge is on display at the Hirshhorn through November 12, 2018.